The Lowes Foods Store in Clemmons, North Carolina is buzzing with excitement as they prepare for a visit from a country music star and North Carolina native Scotty McCreery. 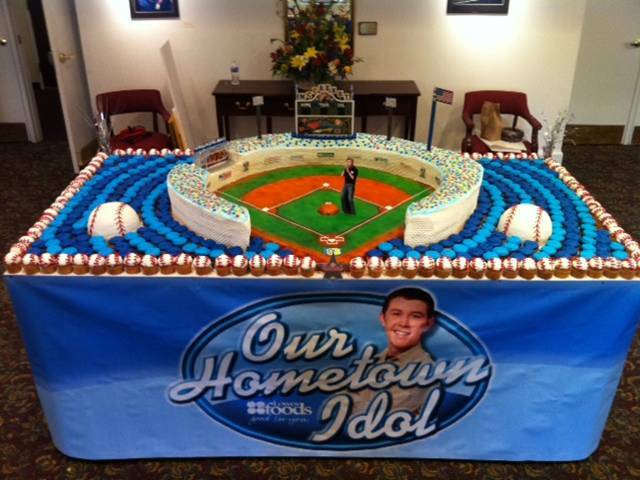 Bakers from North Carolina-based Lowes Foods made a cake display for Scotty McCreery during his hometown visit for the show American Idol in 2011. Their creation included 750 cupcakes, and more than 100 pounds of icing. 20 year-old Scotty McCreery is busy these days juggling his time as a college student at North Carolina State University and his country music career. In 2011, he became the season 10 American Idol winner. On Tuesday, McCreery won again. This time he was named the best breakthrough artist at the American Country Music Awards in Las Vegas. His former employer, Lowes Foods, will celebrate his big win this weekend during his visit to the newly renovated store in Clemmons. “Scotty’s hometown is in Garner, North Carolina where he started out working in our grocery store in October 2010. Judy, Scotty’s mom, called us and asked if we would consider selling Scotty’s CD See You Tonight and we of course we said yes. As a thank you, Scotty is coming to our Clemmons store to meet with some of our guests,” says Debbie Williams is an executive assistant to the President of the grocery chain. Williams says McCreery worked as a bagger and cashier during the audition process for the singing talent show. The store held community events to show their support for him during the competition. 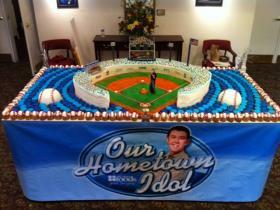 Lowes Foods even made an eight-by-four foot cake display of him for the American Idol viewing party in Garner. Williams says officials at the Clemmons store will pass out wristbands to the first 300 people for an autograph and meet and greet with McCreery. Some lucky fans may even get a chance to sing with him at the event. “We will start giving out those wristbands at Noon on Saturday. There will be a tent in the parking lot outside of our store. The other exciting thing is that we have ten students from West Forsyth High School choir coming to our store and we are hoping that Scotty will join them in a couple of Christmas songs from his Christmas CD,” says Williams. The public autograph signing with country music star Scotty McCreery will take place Saturday, December 14 from 4:15 p.m. to 5:15 p.m. at the Lowes grocery store in Clemmons. I pretty sure that he had fun. and singing with the Choir. I hope we get to see some videos from it. I bet he did super fabulous.